1/3 cup roasted hazelnuts. Learn how to roast them here. 1/4 cup unsweetened cocoa powder. My favorite is Pernigotti. Two disks Mexican chocolate (~6oz). I used this Ibarra but you can use any chocolate you like. Or you can make it yourself, like this recipe. Roast the hazelnuts using whatever method you like. See this link. Do this first so you can let them cool. I wrap mine in paper towel after roasting and toss them in the freezer for about 10 minutes while getting the rest of the ingredients together. Put the sugar, flour, cocoa powder and salt into a food processor or bowl and mix to combine uniformly. It’s not really critical because it will all mix later. Toss the cool hazelnuts into the food processor and pulse until the entire mix is a sandy consistency. This shouldn’t take more than 5-10 seconds or you’ll make Nutella! Cut the stick of cold butter into chunks. I cut it the long way, then cut each of these in half so you have four long pieces. Then lay these next to one another and chop them into little pieces, maybe 1/4″ thick. It doesn’t have to be precise since you’re just tossing it in the food processor. Add in the chopped butter to the food processor and pulse a few more times to mix and break the butter into smaller pieces. Again, not too much or you’ll cream it. Pour the crust mixture into a pie or tart pan and press it into shape in a relatively even layer. Don’t worry about buttering the pan. There’s enough butter and oils in the mix to keep things from sticking. Put the completed crust on a pizza pan or cookie sheet (for easy handling) and bake for about 15 minutes so it sets up. You can use pie weights or just let it puff up. Use your favorite chocolate melting method to melt the chocolate and butter. Here are some techniques. I usually just nestle a metal mixing bowl over a pot with a couple cups of lightly boiling water. Whisk the melted mixture together so it’s nice and creamy. 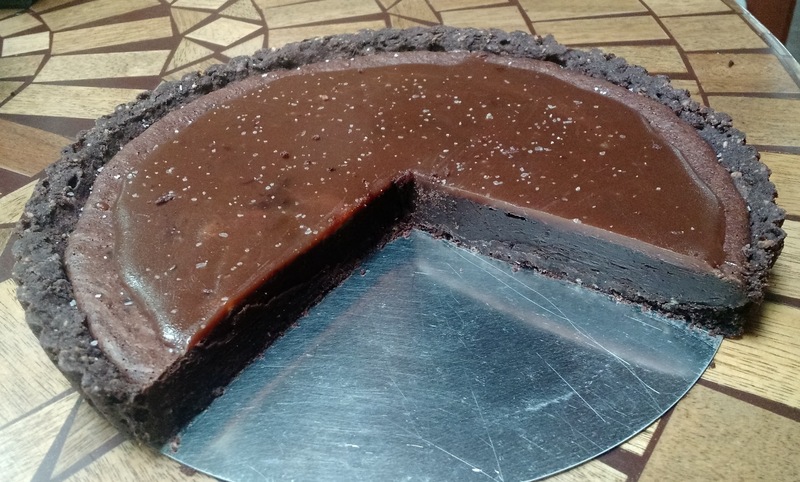 You don’t have to go crazy but since the Mexican chocolate is grainy, it takes a little work. Remove the mixing bowl from the heat. It’s convenient to put it on a kitchen towel. Avoid getting water in the chocolate mixture or bad things might happen. Grind the Mexican cinnamon stick to a fine powder with mortar and pestle. Or just use a tsp of ground cinnamon. Or leave it out if you don’t like cinnamon. Beat the eggs, sugar, coffee, vanilla and cinnamon so it’s well mixed. Bake the pie for 10-15 minutes. The center should still be goopy while the edge will look more cooked. Cool pie on a wire rack so it sets a bit before adding caramel sauce. Heat at medium until the sugar dissolves. You can swirl the pan around to mix it but don’t mess with it too much or it may crystallize! If it does, just add more water and reheat. All the water evaporates during the process so the exact amount of water isn’t important. Make sure you have the 1/2 cup of cream standing by. You’ll need it later. 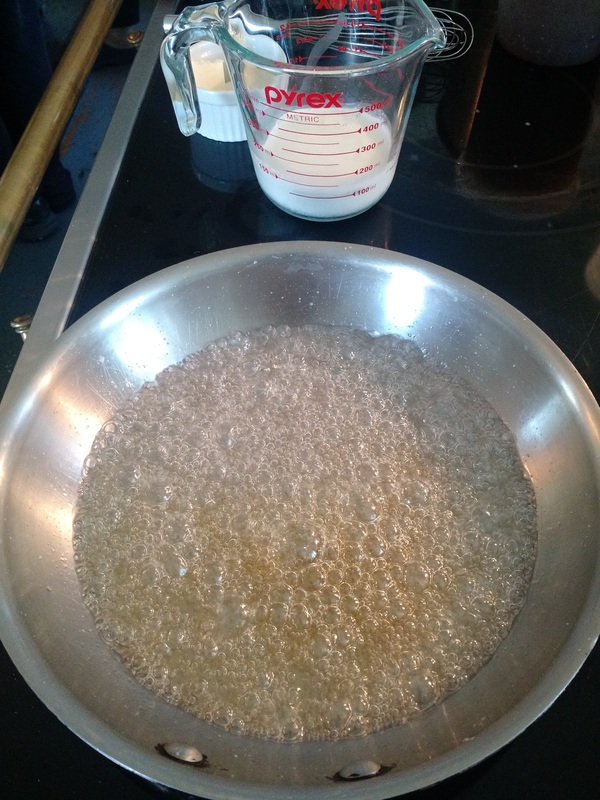 Once the sugar is all dissolved, you can brush the sides of the pan with water so all the sugar crystals are dissolved and the pot just has the melty goodness. Keep heating, resisting the urge to mess with it, until it turns amber. Again, you can swirl the pan to even out the heating if you see some parts browning before others. 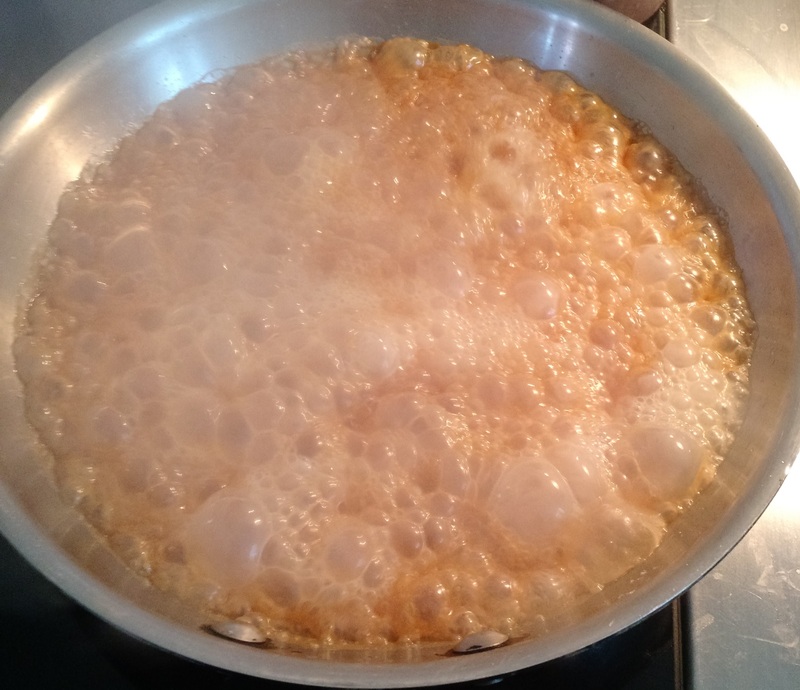 Suddenly, the bubbles will change and the caramel will turn that characteristic amber color. Keep going just a little longer then remove from heat before it burns and immediately add the cream. Be careful because it will bubble and steam a lot! 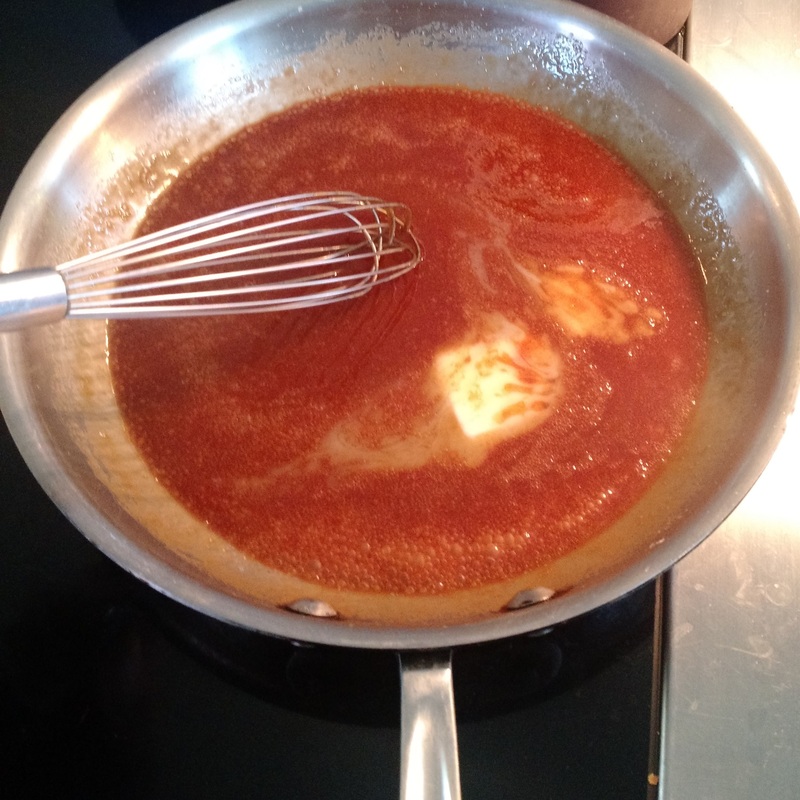 This halts the browning process, allowing you to get it just the way you want the caramel. Add the butter and a healthy pinch of coarse salt and whisk it all together. Do not, I repeat, do not, stick your finger in the mix to taste it. This stuff is hot, hot, hot! Just set it aside for a few minutes to cool, then pour however much you want on your completed tart that has been cooling for the last 10-15 minutes. Sprinkle with more coarse salt to your taste. You probably won’t use all your caramel sauce, so bottle the rest and store it in the fridge for later use. Chill the tart in the fridge for an hour or two until completely set. When chilled, it will have a fudge-like consistency. If you like it a little gooey, you can chill it less but it will get ugly when you cut it.